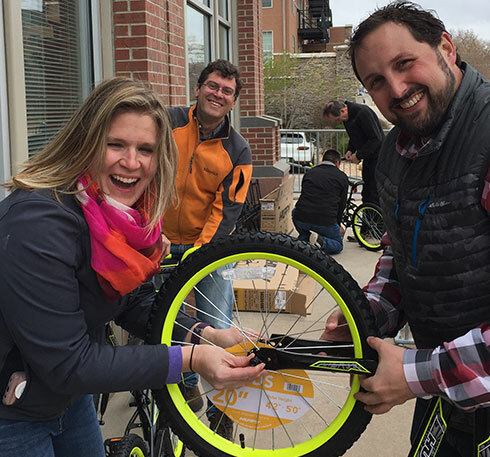 Five RMH engineers participated in an event on April 13 to assemble new bicycles for local kids in need. The bikes were assembled at Big Ring Cycles located in Golden, Colorado. The bike assembly was organized through the Wish for Wheels organization, a non-profit with a mission to change kids’ lives with the gift of a new bike. After the bikes were assembled, they were transported to Vivian Elementary School in Lakewood for distribution to a second grade class. The RMH participants in the event were Jeff Elsner, Alex Infante, Penny Jordan, Rick Phillips, and Michelle Swanson. The local office of Trane also helped to organize the event..